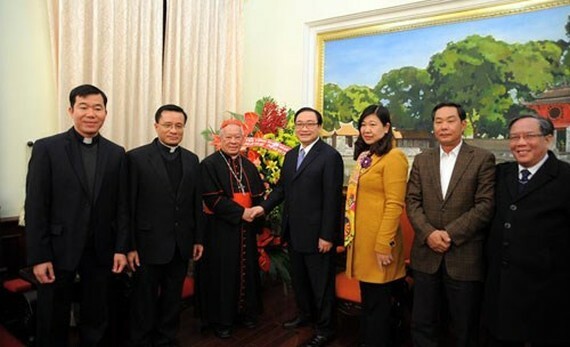 Cardinal Nguyen Van Nhon and priests of the Hanoi Archdiocese on January 31 extended traditional New Tear (Tet) greetings to the Hanoi Party Committee. The delegation was hosted by Secretary of the municipal Party Committee Hoang Trung Hai. Cardinal Nguyen Van Nhon, Archbishop of the Hanoi Archdiocese, wished Hai and the committee a successful year with good health and all tasks fulfilled. For his part, Hai conveyed best New Year wishes to the Catholic community in the Hanoi Archdiocese. He briefed the guest on major socio-economic achievements of the city in 2017 as well as the development orientations in 2018. He recognised contributions of the Hanoi Archdiocese and Catholic community in the growth of the city in all fields, especially education, health care and environment. He affirmed that religious and belief activities are the right of everyone, pledging that the city will continue supporting and creating optimal conditions for the activities. Hai also showed his belief that Cardinal Nguyen Van Nhon and Catholic community in the city will continue promoting their tradition of solidarity, contributing to reinforcing the great national unity bloc and building a capital city of peace and prosperity.